Knight, aka TP Black Knight, is a striking, dark brindle, 20-month-old male born June 18, 2001. 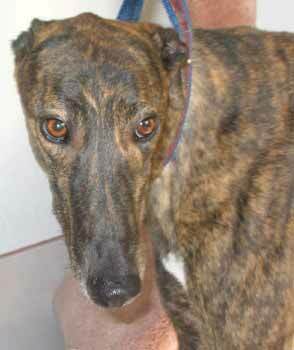 Knight is a very shy boy who came to us because he refused to run. He is super friendly if you are on the other side of a fence, but once you cross over to his turf he will get very nervous and move away. We are working with him acclimating him to the lead. Knight is a wonderful boy who has the ability to be the best friend you could ask for given the chance to get to know you, at his pace. He needs a home that has a lot of love, time and patience to help him make the transition into "the life of Riley". 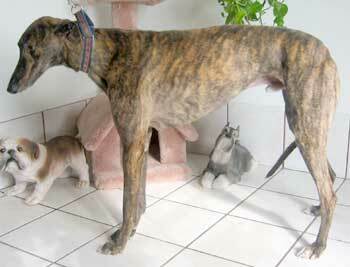 He would do well in a home with another greyhound, and with someone with lots of quality time to spend with him. It is not known at this time if he is small animal or cat tolerant.